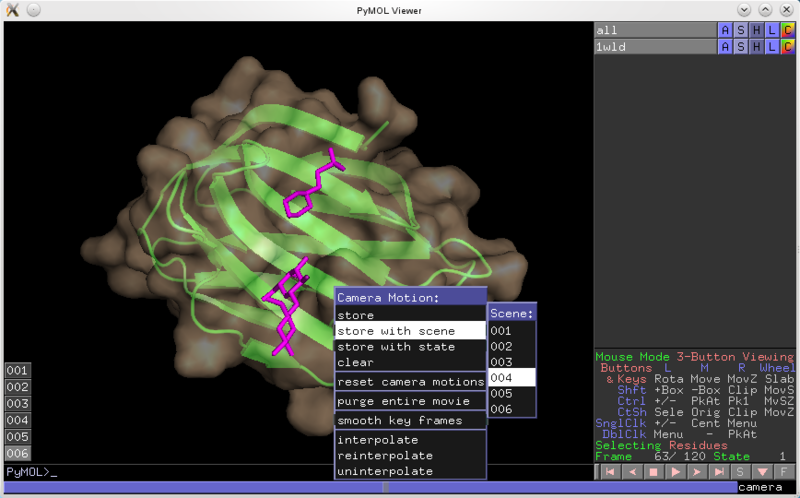 PyMOL's new graphical user interface for movie-making allows users to create molecular animations without typing any commands. Objects and cameras can be moved around a scene in tandem, or independently of each other, to create a movie while PyMOL handles the mathematical details in the background. structures and then export the data for sharing. Movies can be programmed to smooth data, illustrate hydrogen bond ephemerality, and even simulate slow motion. PyMOL's moviemaking capability smoothly transitions from scene to scene so that the audience continues to have a frame of reference during perspective changes. Improved movie made with PyMOL refinements.